Parishioners recite the "Hail Mary" while holding their rosaries before Mass begins at Holy Family Catholic Church in Edinburg. EDINBURG — In the mid-1960s, when Holy Family Catholic Church was founded, agriculture still dominated the local economy and the lives of people. The founding of a new parish was just one sign of the tremendous growth that was beginning in the city. Over the past 50 years, the church has grown from a small wooden structure in a modest neighborhood of dirt streets to a modern church complex, just as the city has grown in population and a more-diverse economic base. The parish is celebrating its 50th anniversary with an event dubbed Golden Jubilee. Festivities will take place at 5:30 p.m. Saturday with a Celebration Mass including Bishop Daniel E. Flores, and a Celebration Banquet following at the Edinburg Activity Center. 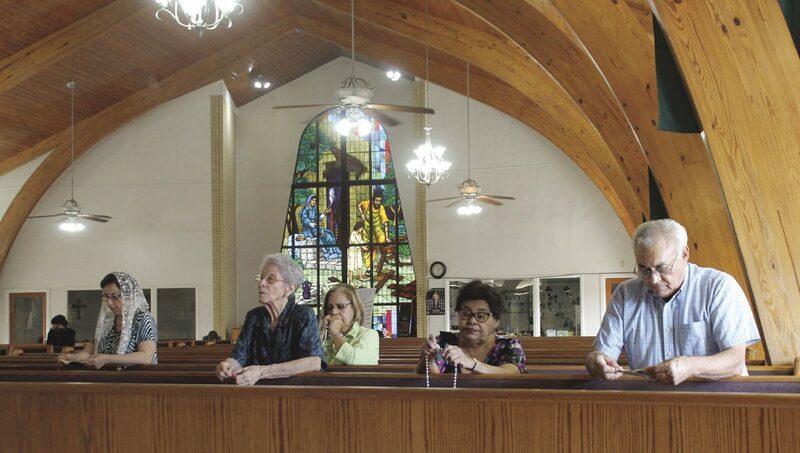 Long-time residents, such as Mr. and Mrs. Jose Robledo, who are now both in their 80s, have seen the growth of the city since the 1940s, when the idea of a third Edinburg parish was in its infancy. 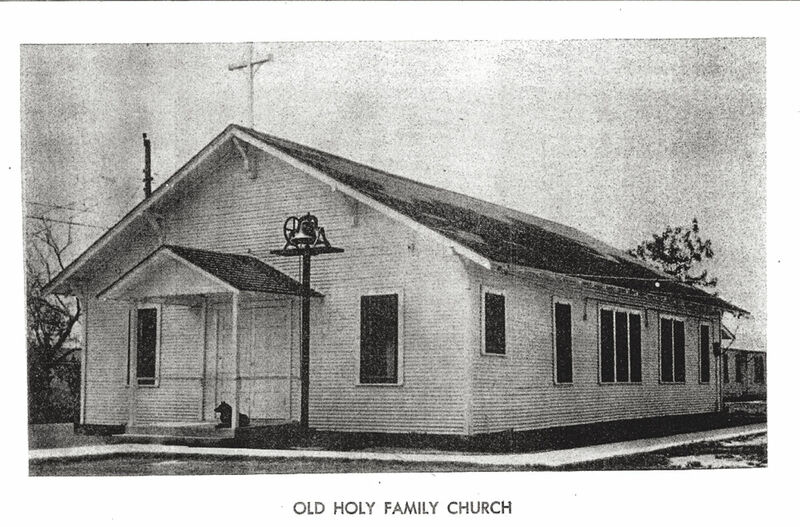 The original Holy Family Catholic Church in Edinburg in an undated photo. In the early 1940s, Rev. Emmanuel B. Ledvina, Bishop of Corpus Christi, acquired the property on Champion Street. In the 1960s, Rev. Humberto S. Medeiros of Massachusetts was ordained the bishop of Brownsville, with that came the establishment of the Diocese of Brownsville. Medeiros saw the growth of the Catholic community in the Rio Grande Valley and began the building of smaller parishes. Edinburg was on the list to receive a new parish as the two existing parishes, St. Joseph Catholic Church and Sacred Heart Catholic Church, were filled to capacity. On Sept. 12, 1967, Holy Family Parish was dedicated and the new pastor was Rev. Clemente Grzenia, who transferred from Harlingen. “By the time we moved here (in 1945), we had heard the rumors that they were going to build the church.” Jose Robledo said. The Robledo children were also involved in the parish. They were altar boys and their daughter was a parish queen. During Grzenia’s tenure at the church, he went to the community and visited families to join him for Mass. The first families were the Robledos, Mr. and Mrs. Regino De Los Santos, Mr. and Mrs. Narciso De Los Santos and Mr. and Mrs. Enrique Villarreal. A few days after the first Mass with approximately 200 families was celebrated, Hurricane Beulah came ashore near Brownsville, causing extensive flooding to the church’s neighborhood. While the floodwaters receded, religious classes were held under a tree in a neighbor’s yard, and the attendance for the Masses drew under 100 families. Rev. Thomas Luczak has served as pastor since 2013. The Masses have increased over the years, along with the new families moving into the area. As the 50th anniversary approaches, approximately 500 families with 1,000 individuals attend Mass in the parish each week. In recent years, the parish has expanded to a full city block, which includes the church itself, church office, CCD building and parking. Parishioner Blanca Gonzalez began attending the church almost 10 years ago because the pastors at Holy Family Catholic Church spoke Spanish, which she didn’t speak, and has become active with the parish. Another parishioner, Dolores Urey, has been active with the church for almost 20 years and has worked with church as a CCD director and still serves the church in various capacities.